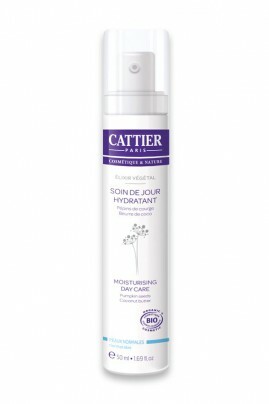 Cattier Organic Moisturizing Day Cream "Elixir Végétal" offers genuine moisturising day care for normal to combination skin. Organic coconut butter, with its nourishing and antiseptic properties, intensely moisturises* and purifies the skin. Organic jojoba extract forms a non-greasy protective film that normalises sebum production and maintains the skin’s natural hydration. Organic pumpkin seed oil, with its high vitamin, essential fatty acid and mineral content, has an anti-oxidant and anti-free radical action and nourishes the skin in-depth. 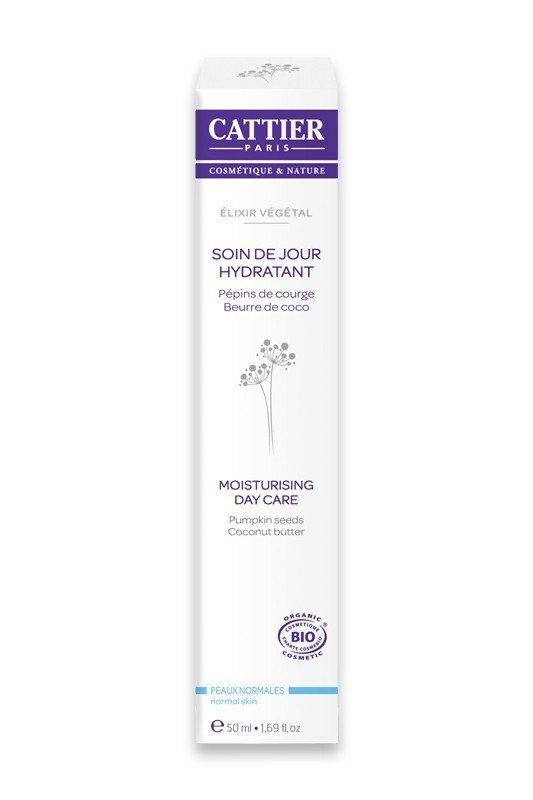 Rich in Organic cornflower water, Cattier Organic Moisturizing Day Cream "Elixir Végétal", with its fresh and delicate fragrance of essential oils, softens and refreshes the epidermis. Also available in mini size, perfect for trial and travel ! After having thoroughly cleansed and dried the skin, apply a measure of Cattier Organic Moisturizing Day Cream "Elixir Végétal" all over the face, throat and décolleté until completely absorbed. Apply daily in the morning for supple, soft and perfectly hydrated skin. Organic Cornflower flower water, Glycerin (vegetable), Squalane (vegetable), Organic Coconut butter, Organic Jojoba extract, Organic Pumpkin seed oil, Silica. Organic Aloe vera, Glycerin (vegetable), Organic Coconut Butter, Organic Jojoba Oil, Plant-based Squalane, Organic Pumpkin Seed Oil. Aqua, Caprylic/Capric Triglyceride, Glycerin, Sorbitan Stearate, Squalane, Cocos Nucifera Oil*, Simmondsia Chinensis Seed Oil*, Stearic Acid, Silica, Cucurbita Pepo Seed Oil*, Aloe Barbadensis Leaf Extract*, Xanthan Gum, Tocopherol, Lactic Acid, Methyl Glucose Sesquistearate, Benzyl Alcohol, Sodium Benzoate, Parfum.